So our honey bees have been going strong all year. 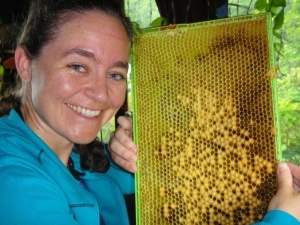 In their first year, they aren’t expected to make any honey we can take. They are just supposed to get themselves ready for their first winter. Our bees this year did more than that. Last week we collected the extra honey and it looks like we might get 30-lbs of the sweet stuff. Getting at the honey involved shaking and banging the bees off the frames, while trying to kill as few as possible. I was only stung twice and neither stings were that bad. The inner thigh again—it’s like they instinctually know that’s a sensitive area—and the forehead, which I thought would be worse than it was, but just made it seem like a had a GIANT zit for a few days. We checked in on our honeybees after one week. The queen is roaming, laying eggs, and they seem to have taken nicely to her. The hive looks healthier than they started last year. There doesn’t seem to be a massive amount of diarrhea on the hive and when Matt and I strolled our yard the other day we saw our very one little honey bees pollinating our black berry bushes. It makes me happy.